GoodLife Fitness offers its members goal-oriented fitness plans, individualized feedback of progress and collaboration with medical providers upon request. 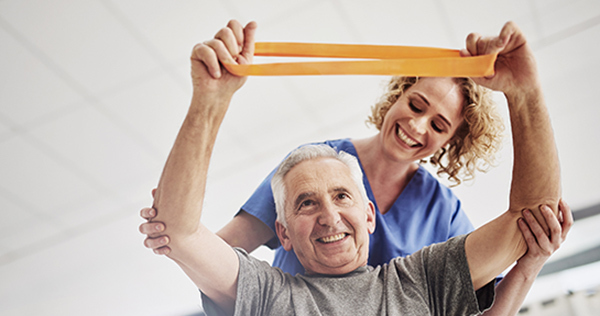 GoodLife Fitness may also work in conjunction with rehabilitation services including inpatient and outpatient rehabilitation, lymphedema management and anodyne therapy. Rehabilitation services are offered at Jerome Home and Southington Care Center. The program helps older adults who want to improve function and “live the good life". GoodLife Fitness focuses on strength, balance and endurance training designed specifically for older adults and individuals with special health needs such as arthritis, pre and post-joint replacement, neurological impairment (post-stroke), Parkinson's and Alzheimer's disease, multiple sclerosis, lower back pain, osteoporosis, diabetes, fibromyalgia or cancer. This program is ideal for the person recovering from an injury and/or illness or is experiencing a decrease in flexibility, an increase in falls, back pain, chronic pain or decreasing fitness. Those who join the GoodLife Fitness program receive one-on-one assistance from an exercise physiologist.